CannabisNewsWire Editorial Coverage: The CBD market is seeing strong growth and a move towards the mainstream. Wildflower Brands Inc. (OTCQB: WLDFF) (CSE: SUN) (WLDFF Profile), which focuses on health and wellness products, is benefiting from this growth through the establishment of strong distribution deals. Focused on the organic market, Green Organic Dutchman (OTCQX: TGODF) (TSX: TGOD) has significantly increased its output to meet demand. Aurora Cannabis Inc. (NYSE: ACB) (TSX: ACB) has earned its CEO industry-wide recognition through strong growth and a powerful place as a market leader. HEXO Corp. (NYSE American: HEXO) (TSX: HEXO) is pushing CBD and cannabis toward the mainstream through connections with food and consumer product companies. Significant developments in science and agriculture, where Charlotte’s Web Holdings Inc. (OTCQX: CWBHF) (CSE: CWEB) is making great steps forward in developing low-cost high-quality hemp, is also strengthening the plant. The growth of the CBD market has so far come mostly out of North America, where the likes of health and wellness company Wildflower Brands Inc. (OTCQB: WLDFF) (CSE: SUN) have marketed a wide range of CBD products. This geographical focus is thanks mostly to questions of legality, as CBD is extracted either from cannabis or from its nonhigh-inducing form hemp. Though legalization of cannabis remains variable in the United States, hemp is now legal at a national level in both the U.S. and Canada, with cannabis growth widely permitted. As a result, the North American cannabis market, including that for CBD, has grown in spectacular fashion. The market was worth $9.2 billion in 2017 and is predicted to reach $47.3 billion by 2027. It’s this market that has proved so fruitful for the likes of Wildflower Brands. Of course, the CBD market hasn’t only been shaped by years of cannabis prohibition; contributing factors also include society’s acceptance of cannabis and CBD. The rules of organizations not normally associated with cannabis can provide a hindrance to companies such as Wildflower Brands. But as the legal market develops, those institutions are shifting their attitudes as well. Cannabis and CBD are used in a wide range of pain treatments and products, including those such as Wildflower’s topical treatments. Given the injuries frequently incurred in professional sports, pain management is essential, and players seek access to the best range of medicines. Currently the ban on cannabis and CBD restricts players from choosing such seemingly effective options, fueling the call for change. Of course, all this expansion comes with significant challenges. As the market grows and evolves, CBD companies must find ways to distribute products to a sector that didn’t exist a decade ago. The infrastructure most other industries take for granted is being built from scratch. Fortunately, the companies moving into this space are willing to adapt and move quickly to support their expansion. 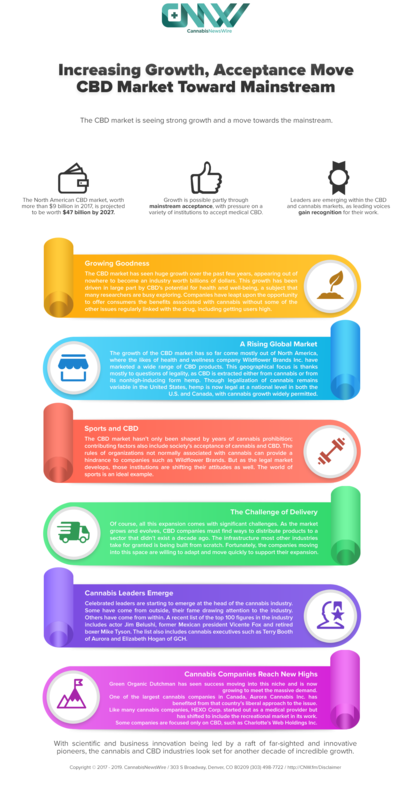 This involves forging alliances with other players within the cannabis sector to increase their combined reach. Wildflower has recently done this through a delivery fulfillment agreement with HelloMD, a leading digital healthcare platform for cannabis doctors, consumers and brands. The deal will allow Wildflower to potentially reach more customers through HelloMD’s expansive e-commerce platform. One of those is the growing interest in organic and sustainably grown cannabis, which aligns with the existing market for organic fruit and vegetables. Green Organic Dutchman (OTCQX: TGODF) (TSX: TGOD) has seen success moving into this niche and is now growing to meet the massive demand. The company is building two new facilities to expand its production base, with growing capacity set to increase from 156,000kg to 202,500kg. Green Organic Dutchman is also looking at the wider global market, with an investment in Jamaican cannabis. One of the largest cannabis companies in Canada, Aurora Cannabis Inc. (NYSE: ACB) (TSX: ACB) has benefited from that country’s liberal approach to the issue. Early and widespread legalization have given Canadian cannabis companies an opportunity to expand in both the recreational and the medical markets. Aurora is one of the highest trading cannabis stocks on the NYSE and is going from strength to strength. The company’s acquisition of 51% interest in a Portuguese cannabis company has positioned the Aurora for expansion in Europe as that market starts to mature. Like many cannabis companies, HEXO Corp. (NYSE American: HEXO) (TSX: HEXO) started out as a medical provider but has shifted to include the recreational market in its work. As the first cannabis producer to join Food & Consumer Products of Canada (FCPC), the company is offering cannabis products as part of its wider range of consumables, reducing the stigma and barriers to entry. Such bold moves have led to a 1,269% increase in gross revenue, a performance made possible by a combination of strong leadership and market growth. Some companies are focused only on CBD, such as Charlotte’s Web Holdings Inc. (OTCQX: CWBHF) (CSE: CWEB). The company’s work in producing high-quality, low-cost hemp through proprietary genetics earned its vice president of cultivation Jared Stanley a place in the cannabis top 100. The science of cannabis cultivation is still in its infancy, but it’s moving fast, and by improving knowledge and techniques, pioneers such as Stanley are laying the groundwork for future growth.